Often photos can say much more than words ever will. 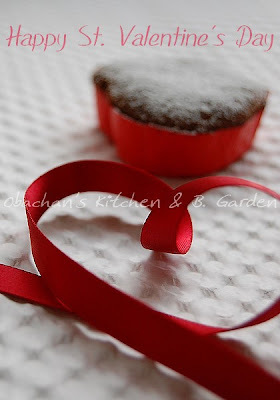 ... that obachan failed to bake heart-shaped chocolate cupcakes and made a heart with ribbon instead. Yeah, right. Those paper cups did not look firm enough at the store, but I was optimistic. Unfortunately the optimism didn't pay off, and after my cupcakes swelled up, they looked more like amoeba. :O This one in the photos was the best one (as long as you don't see the other side of it). with your sweetheart :) "
Pretty pictures! Happy Valentine's Day! still wonderful, happy valentine's day to you!! They are still so kawaii. Happy Valentine´ Days to you too! Hope you had a happy Valentine's day there. I loved those kitties on your site. Thank you. Hope you had a romantic day. I'm so happy to hear that. It took a while to make the ribbon look like that.